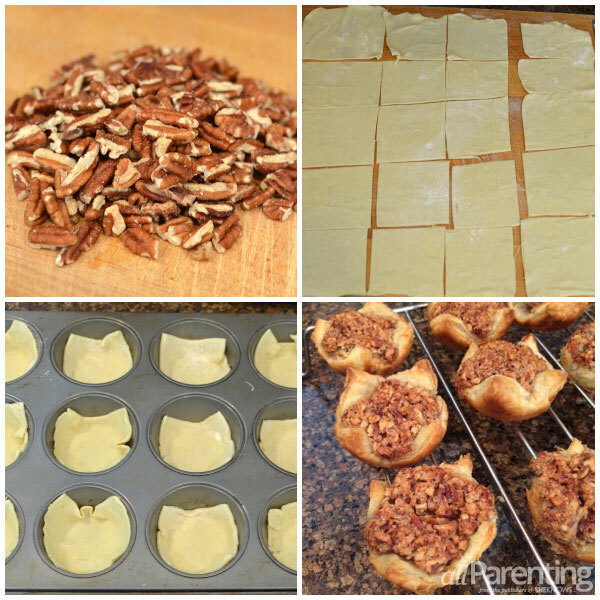 Put down the pie shell this Thanksgiving and make easy mini muffin tin pecan tarts. Puff pastry layered with crunchy, sweet pecans, your family will love the newest dessert addition at the holiday table! Make dessert ahead of time this Thanksgiving to save time and your energy! Instead of making your standard pecan pie, use a muffin pan and make mini pecan tarts that your whole family will love! Store-bought puff pastry is light and fluffy and a whole lot easier to use than making your own pie crust. Just thaw and cut out squares of puff pastry to fill the bottom of your muffin pan. 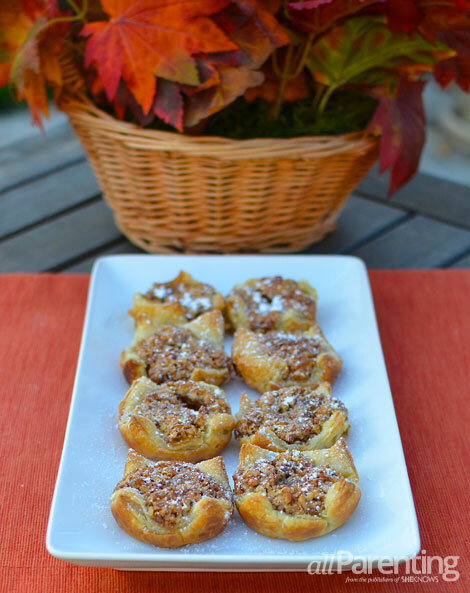 You will have mini pecan tarts in no time, perfect for a bite-size Thanksgiving dessert! In a mixing bowl, combine Karo syrup, egg, egg white, sugar, melted butter, vanilla extract and pecans. Unfold a puff pastry sheet on a lightly floured surface. Cut the puff pastry sheet into 20 squares, about 3 inches. Repeat with second puff pastry sheet. Spray muffin pan cups with nonstick spray. Press the squares into the bottoms of muffin pan cups. Spoon 1 teaspoon pecan mixture in the center of each muffin pan cup. Bake the pastries for 12 to 15 minutes or until they're golden brown. Remove the pastries from the pans and let cool on a wire rack. Top with whipped cream or sprinkle the pastries with confectioners' sugar.